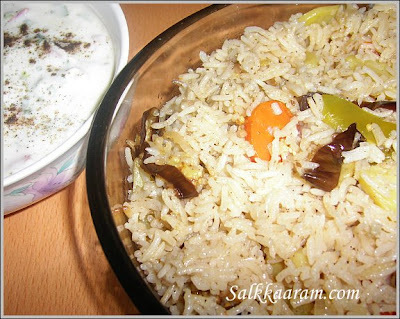 Brinjal/Eggplant Rice | Simple and Delicious ! 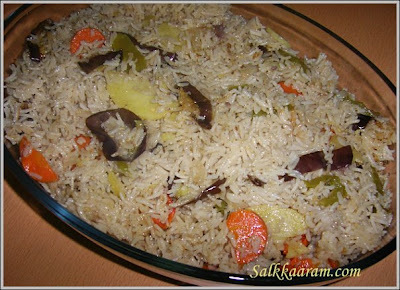 Brinjal or Egg plant rice is an Arabic dish. I learnt to prepare this from my Aunty. Last time when I met her, she cooked tasty Brinjal rice with chilli chicken and salad. This is a good way to make kids eat vegetables. Boil 4 cups of water with enough salt and cinnamon sticks. Chop all vegetables as shown in picture. Sprinkle little salt on them. Chop onion and tomato too. Heat oil, fry brinjal first. In the remaining oil, sauté onion, then add potato, capsicum and carrot. Stir for few minutes till them are half cooked. Stir by adding pepper powder. Place the fried brinjal over this. Then place the washed rice,add the previously boiled water into this and bring to boil. When it boils, check salt, reduce fire, cook covered on a low flame. . If the rice is ¾ cooked, remove from fire and keep the lid closed for 1 hour. Chop onion, tomato and coriander leaves. Mix them with pepper powder, salt and curd. Brinjal in rice that is a good way of making kids eat their veggies. I will try it out on my daughter. Hey Seena great recipe your pic looks real tasty. :) Your rice recipes always look and sound lovely. I am curious to see how the brinjal with taste with all the other veges. Definitely, you can try for your daughter. Brinjal adds taste to this preparation..
thank u so much,,, i had plenty of brinjal and was thinking wat should i do with these.. and ur recipe saved me .. all of the recipes i hav tried so far ahv turned out to be very good..
Seena, I'm a recent visitor to your blog, and what struck me was how simple AND delicious your recipes really and truly are!!! I just tried this eggplant rice, and it was such a big hit at dinner time - my husband loved it. he thought i had spent hours slaving at the stove. Oh my gosh, how and when will i be able to try out all your otherrecipes!!!! thanks so much for this delightful repository of great recipes - than you for SHARING!!! thanks for the fb, glad to know you enjoyed it.keep trying out more, I was little busy, thats why late to reply..
Dear Seena, I tried ur Eggplant rice and blogged about it today!..Thanks for sharing the recipe. Hope u r doing good! Hi Seena, I tried this recipe. Very good, A very easy and delicious way to include some vegetables in the diet.